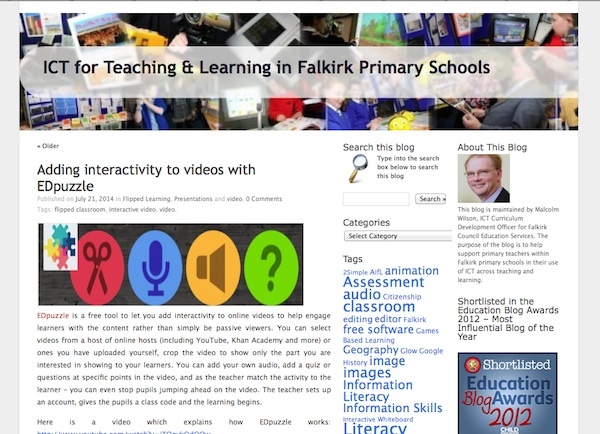 ICT for Teaching & Learning in Falkirk Primary Schools from Malcolm Wilson, ICT Curriculum Development Officer for Falkirk Council Education Services. Post links, screenshots and information about online resources. Organise resources with categories and tags. Initiate discussion with other people with the same interests. Add supporting material, files, video and audio. Network and publicise your posts automatically through Twitter. Tip Use the Press This tool to quickly post resources from anywhere on the internet to your blog. Drag-and-drop the Press This link to your bookmarks bar or right click it and add it to your favorites for a posting shortcut.